Quezon City – One of the greatest blessings in life is to have parents. They are our first teachers who helped us shape our characters, values, and even how we view the world. Growing up with Filipino parents is a privilege not only because they go a great distance to make sure their children have a brighter future but also because their children are provided with everything they can provide for as long as they can. 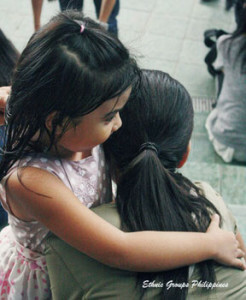 Most Filipino parents are perceived as laidback and calm, whose sole source of joy are their children. Husband and wife share an equal relationship, with the former commonly referred to as haligi ng tahanan or literally, “pillar of the house,” and the latter commonly referred to as ilaw ng tahanan or literally, “light of the house.” Although easygoing, parents do make sure that proper values and respect are instilled early on in a child’s life–from using po and opo, to calling older siblings ate (“older sister”) and kuya (“older brother”) as a sign of deference to their elders. Traditionally, the father is the breadwinner who provides for everyone, while the mother focuses on running the household, homemaking, and caring for the children. Nowadays, however, more and more mothers are contributing to the family’s income by working full time or part time. Others even leave home and work overseas to augment the family income, thus providing an opportunity for a greater home and for children to obtain higher education in more exclusive schools. With more women bringing home the bacon, there is now an increasing number of “house husbands”–that is, men who fulfill the traditional role of wives. These house husbands, also called stay-at-home dads, assume the usual role of the mother in raising children as well as in doing the household chores. In addition, grandparents sometimes take over and act as guardians while both parents are working. Occasionally, older siblings take charge of everything in the absence of their parents. The changes in the economic situation in the Philippines have brought about numerous changes to the traditional concept of family. In spite of this modernization, however, studies show that Filipino family members remain close-knit and support one another in times of need. The wonders of technology and the advent of social media has kept almost everyone easily accessible and within reach. Moreover, Filipinos take reunions seriously and value the presence of not only their immediate family but their extended family as well. Just like other families from around the globe, the Filipino family is gradually adjusting to adapt to the present economic and social conditions for its survival. Conventional roles of the husband and wife have changed, and marriages have been troubled by the pain of physical separations as one have to risk working abroad for a better paying job. This trend can be foreseen to continue for as long as it is necessary. The Filipino family has undergone huge changes in the last century as demographic, social, and economic factors require everyone to adapt to new conditions.